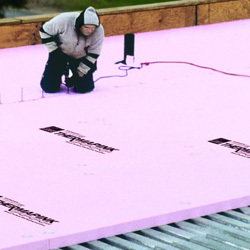 This type of insulation is typically used on the exterior of the building during construction or under siding, and is used between studs on the interior walls. Foam board can also be used over concrete walls to insulate your basement, and to insulate ceilings and roofs. If you are insulating your basement walls but don’t want to give up the space to construct 2×4 framing, foam insulation board might be a good option because it can attach to a basement wall with wood furring strips—no framing necessary. Foam board can be made from polystyrene, polyurethane, or polyisocyanurate. Boards typically come in 4 by 8 foot sheets and can be cut to size with a small handsaw or utility knife; thickness can range between a half inch to four inches. Depending on the thickness of board you select, R-values will variate accordingly. Kinzler Construction Services delivers an industry-leading customer experience. Contact us today at 888-292-2382 to see if foam board insulation is the right product for your project. Let Kinzler Construction Services help make your project successful.